Eye (and ear) candy Friday. no matter how crabby your cube mate is). I went to Ikea with my friend last night. All at the same time, we left the store, the rain ended, and the sky became a beautiful mix of colors. He snapped a picture of me silhouetted against the sky. Eye candy Friday: the doggy edition. Smokey brought me a pot of daffodils last weekend. Love that guy! I thought y'all should know, if you don't already, one of the joys of photo editing software. Mine is iPhoto, which came installed on my Mac Mini. #2 Son has ordered me to add this photo of he* him and his bike on a hockey rink. He suggested that a video would be more impressive because it would show how fast he can get going. I don't know -- could YOUR heart stand the excitement? * Sheesh -- use English much, Kat™? Eye candy Friday: the random edition. Carved ostrich eggs in store window, Cape Town, South Africa; December 2005. Thank you all for your help in finding someone to design the caduceus for the Christmas mitten! Lisa hooked me up with an amazing Canadian knitter (I know, that's redundant) who has already knit a prototype for me. Follow the link to her Ravelry page -- she has done amazing stuff. I'm going to share the other resources that y'all offered me -- there are some really good ones. (Blogless) Berta in Texas sent me to Knitting Pattern Central for several dishcloths that have wings in their design. Several are by RaAnn Clegg, who clearly loves to create knit and purl designs and is very good at it. KMK (she and I share the same initials) told me about the DNA helix scarf she had in medical school. A light bulb went on over my head. The mittens will be fraternal twins: the other one will have the DNA helix design on the back. Helen offered to design for me, but she has several (amazing!) things OTN right now and wouldn't be able to get to it right away. Thanks again -- you guys are the BEST! ...in which Matthew is clearly participating. 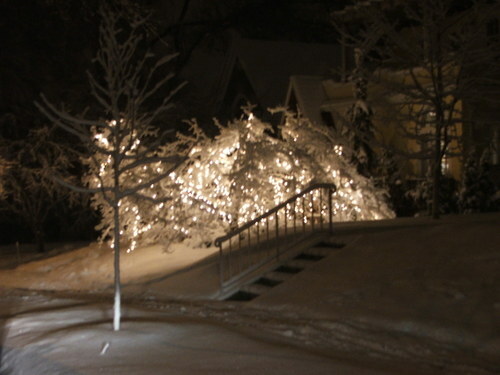 He showed me another of his artistic creations, one which is in the header rotation over at MplsBikeLove.com. He and Maggie surprised me at 8:30 last night by showing up with a pumpkin pie cheesecake and saying, "No one should be alone on Thanksgiving." What a couple of sweeties they are. 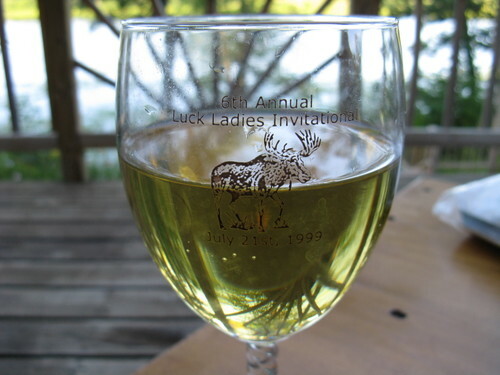 Eye candy Friday: the MLIA version. When I got dressed yesterday morning, I realized all my hand-knit socks were dirty. Later, I decided I could wash one load of laundry that was just hand-knit socks. When I hung them on the rack to finish drying I felt I had achieved a hand-knit sock milestone. MLIA. StumbleUpon is one of the best ways to waste time on the internet. It led me to this site. "In 1986 Peter had the idea of growing a chair. Nine years later Peter and Becky became partners. Pooktre was born. Together they have mastered the art they call Pooktre, which is the shaping of trees as they grow in predetermined designs. Some are intended for harvest to be high quality indoor furniture and others will remain living art." Does this look to you like something that should be preserved? Me, too. Taken a few weeks ago. A viburnum (I think) in front of the library in the rain. Eye candy Friday, the NOT version. I am blogging today under orders from #2 son. He sent me an email with links to these photos and the command, "BLOG THIS." Ever the compliant parent, I am following his instructions. The City of Minneapolis recently revised its downtown street usage and directions. Among other changes, two formerly one-way streets became two-way again, now with both parking lanes and bike lanes at the side. But the lanes are a bit... odd. The bike lane is next to the curb, separated from traffic by the parking lane. Yeah, people no longer park next to the curb. Like I said, odd. There is plenty of signage to help people do the right thing. Below you can get an idea of the layout. Bike lane next to curb, separated from parking lane by a double white line, then driving lane. The parking lane is only a parking lane during non-rush hour times. Those two cars next to the curb? Yup. Parked in the bike lane. One problem immediately evident to everyone who ever rode a bike on a city street is that in this configuration bicyclists will constantly be confronted by passengers opening their doors into the bike lane, getting out of the cars into the bike lane, standing in the bike lane while retrieving purse, briefcase, toddler, and/or packages from the car, and eventually crossing the bike lane to get to the safety of the sidewalk. There does not appear to be any way to avoid that conflict. You have to realize that this is meant as a command to bikes, not a statement of support, in this case. As I was taking the last two pictures, a black SUV pulled up behind me and patiently waited for me to move so that he could park behind the road-sharing Volvo. Ok, I have a plan. Let's do this. Since they are allowed to illegally impede traffic, let's all go over to Steef's shop and get a kickstand out of the box. Then we'll put them on our bikes. Then we'll all go down First Avenue and for every one car parked there like that, let's have one bike take the middle of the right-hand lane and put the bike on a kickstand and say were waiting for someone to come out of the building. Here is what the bikers would really like, bike lanes like those in Paris, with a concrete barrier wide enough to prevent the disembarking passenger/bike conflicts I described above. Highway safety has come to be seen, not just as a matter of educating and exhorting people to drive safely, but also of designing roads and vehicles to enhance and ensure safety. Likewise, part of bike safety means designing potential hazards OUT of the system, not INTO it, as was done here. I have no doubt that conditions and infrastructure will improve. Minneapolis is, if nothing else, a relatively well-run and citizen-friendly city. Like so many things, it's just gonna take some time and some money and some effort. In the meantime, Bicyclists! Be careful -- it is dangerous out there! Just in case you really, really, really need an Eye Candy Friday image, here is one taken at Autumnfest two weeks ago. Eye candy Friday and a quiz. One of these photos was taken where we spent this past week. The other was taken several years ago and thousands of miles away. I was driving home yesterday and decided I needed to take some photos. This is the township road that leads to the gravel road that leads to the dead-end road that leads to our driveway. My favorite time of autumn is when there is still lots of green, so that the occasional burst of color really stands out. Eye candy Friday, of sorts. Last Sunday my friends Colleen and Alan invited me over for dinner on her deck to celebrate my birthday. Dinner was delicious -- pork chops and vegies from the grill, a couple yummy summer salads, and mint chocolate chip ice cream and homemade white chocolate-macadamia nut cookies for dessert. No pictures of the dinner, though; I was too hungry. 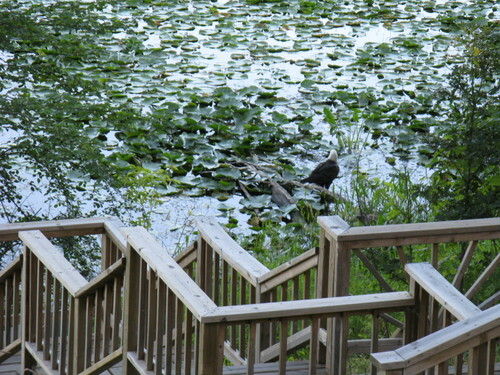 While we were relaxing on the deck, a bald eagle landed to check out the shallows near her dock. Does she have the coolest steps down to her shore or what? 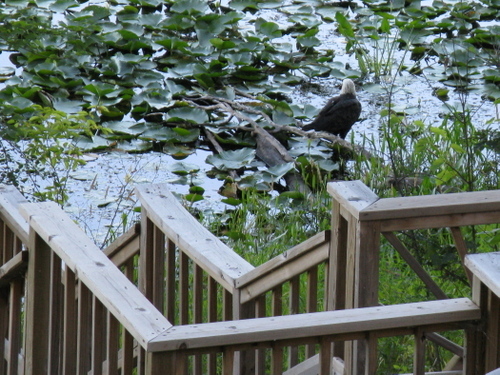 Bald eagles are not uncommon around here, but it is always special to see one close up. One of the most memorable moments of my life* was the evening I was floating with eyes closed on an air mattress in our lake, cooling off after a bike ride. A bald eagle flew slowly over me, a mere ten feet above. The air was so still that the sound of its wings slowly flapping directly overhead was what caused me to open my eyes. I'm glad it decided I was too big to be fair game. * I suspect I have told this story before. Repeating oneself is an unavoidable hazard of age. Please to pretend politely that you have never read this account before. Thank you for your cooperation. Eye candy Friday II, the Free Tibet edition. "None of us are free until ALL of us are free." Beverly at PoMoGolightly is having a Free Tibet contest on the occasion of the opening of the 2008 Olympics. Remember the Mikhail Bakunin quote above; remind yourself of it as you watch the Games. 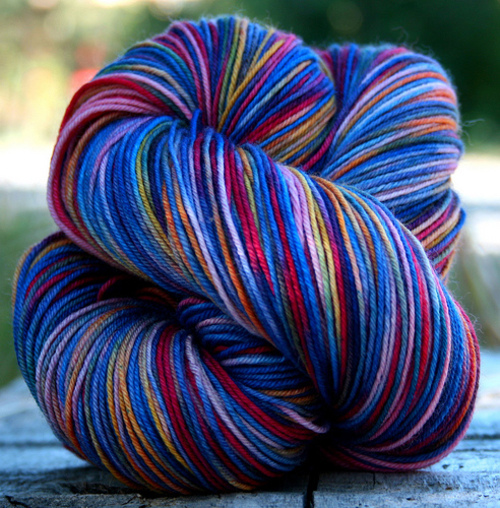 PippiKneeSocks created the beautiful yarn pictured above and will give it to the winner of PoMoGollightly's contest. 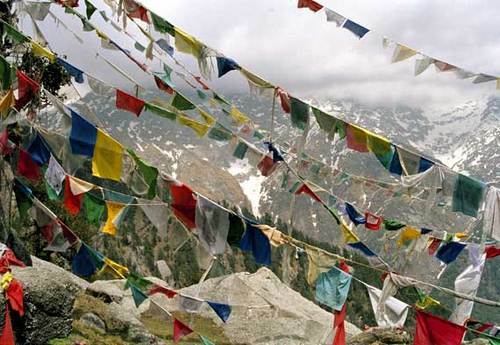 She based the colorway on Tibetan prayer flags. Remember winter? (This was taken March 31, which can easily still be winter in The Great Frozen North.) The frigid season will come again, and if the complaints about the heat that I have been reading all over blog land are any indication, it might feel kinda good. One characteristic of my northern heritage is that round about mid- to late July I start to have the tiniest twinge of longing for cooler weather. Summer is a phantasmagoria that passes in a dream of heat, sweat, tall glasses of iced tea, and beach time. Reality is the rest of the year: cold feet, warm woolens, snuggling under an afghan, snow and ice. Have a great weekend, and enjoy your summer as long as it lasts! 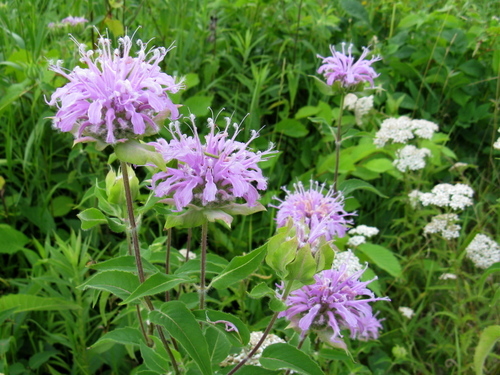 Remember the washed-out photo of the monarda last Friday? This one is more accurate.